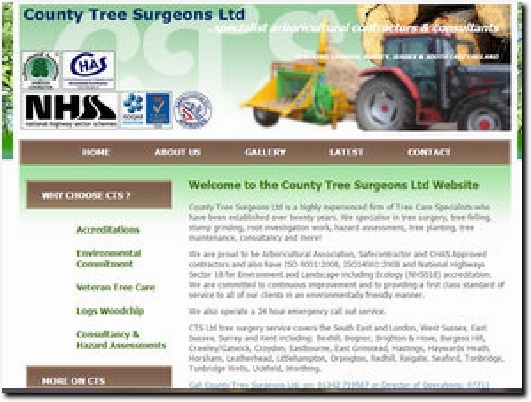 County Tree Surgeons is based in Crawley Down and covers East and West Sussex, London, Surrey and Kent. We undertake tree felling, tree surgery, tree work, tree stump removal and tree felling. Family-run arboricultural business founded in 1987 serving domestic customers, local authorities, county councils, landscape contractors etc. throughout London and the south-east. Accreditations shows the wide range of qualifications held by the business while Environmental Commitment gives details of the ways in which the impact of the company on the environment has been reduced. Contact has phone and e-mail details and a contact form.